In the same week that Donald Trump became President of the US (to the despair of women around the world), this powerful image was much needed. Camilla, the Duchess of Cornwall, was recently in the UAE as part of a Middle Eastern tour, where she and Prince Charles spent three days visiting Dubai, Abu Dhabi and Al Ain. The British royals were here to promote religious tolerance and support women in leadership, among other things – but nothing sums it up better than this picture, released on Wednesday by Clarence House. During her visit, Camilla was accompanied by an all-female protection squad, the palace revealed. The image, which currently has more than 9,000 likes on Instagram, has attracted much praise, with commenters expressing their appreciation of the empowering act. While on the final day of the #RoyalVisitUAE yesterday, The Duchess of Cornwall visited the Dubai Foundation for Women and Children, a shelter that supports women and children fleeing from domestic violence and helps families strengthen ties. Here HRH met some of the people who have been helped by the centre and heard about the work they do across the UAE. What else did Camilla get up to in the Emirates? Along with husband, the heir apparent Prince Charles, the Duchess visited Dubai’s International Humanitarian City, where the royals were shown around by HRH Princess Haya bint Al Hussein. While in Dubai, Camilla also paid a visit to the Dubai Foundation for Women and Children, which is the first licensed non-profit shelter in the UAE for victims of domestic violence, child abuse and human trafficking, as well as a visit to the Al Jalila Specialty Hospital. While at the hospital, the Duchess signed a partnership with Princess Haya between Alder Hey Children’s Hospital in Liverpool, UK and Al Jalila. Camilla, who described the facility as “brilliant”, shared a giggle with Princess Haya as the two signed the agreement. 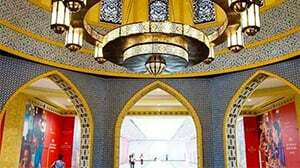 The royal couple also visited Abu Dhabi’s Sheikh Zayed Grand Mosque, where they slipped off their shoes – and the Duchess donned a sky-blue hijab – as they toured the holy building along with some top UAE officials.